What Sadie Did: A quickie: I'm excited! Hi all, a quick break from my road trip pics today! I have the pics of my glacier hike (aka worst day ever!!) for tomorrow. But you may recall I mentioned that I'd won a $75 USD voucher for Shopbop from Aprilia's blog....well I FINALLY spent it today! It has been itching in my mailbox for almost a week!!! If you have been following me for a wee while, you may also recall my earlier watch debates here! Well I have finally made a decision and I am excited for this to arrive. Apparently they deliver worldwide for FREE in under three days - watch this space!! I am also hoping I don't have to pay duty fees - I have no idea the rules and regs of these though! I have never bought from that store, but I am digging that watch! omg, i wish i had bought that michael kors watch. 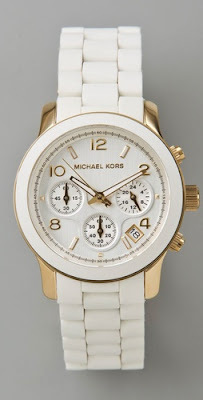 i love shopbop and i love white watches. this is such a great buy Sadie! Disregard my last tweet to you - I had to refresh my cache for the comment box to show up!! You know how excited I am for you to be getting this watch!! I can't wait to see it on you! OH my that watch is amazing!! I have never bought from there, but might have to look into it..
Love it and how lucky of you to have won that gift voucher.. Jealous!! that watch is gorgeous great choice! will definitely take photos of the room i might post that tomorrow! Love it,I have the gold but i want one of his in white! Oh, what a lovely watch, you lucky thing winning $75 to spend at shopbop! I've never shopped there, I don't usually shop online because of the whole waiting to get them, I usually want something straight away if I buy it - I'm so impatient! OMG! I already saw on twitter that you got this AMAZING watch! Totally jealous! AMAZING!!!!!!! I love MK Watches. I've been wanting a white one forever.